Some years it seems I get to spend a lot of time in Narnia and other years not so much. This year I didn't spend quite as much time in Narnia as I would have liked, and yet the time that I did was very meaningful and enjoyable. Another July has apparently come and gone and with it another Chronicles of Narnia Reading Challenge. This past month I managed to read The Lion, the Witch and the Wardrobe aloud to my boys (linked to my thoughts) and watch the movie with them. My oldest took to the book adventure, asking to read more in the series and pulling out his wooden swords in order to do battle against the forces of evil. (Yeah. I like that.) Bookworm2 thrilled in watching the movie and took great interest in Aslan and the White Witch. (He is very focused on the idea of good guys and bad guys at present.) 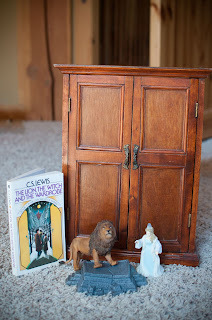 As we read the book, the kids also enjoyed playing with our Narnia figures which I have mentioned in the past. My greatest triumph this month (I think) was in renaming our local football mascot. 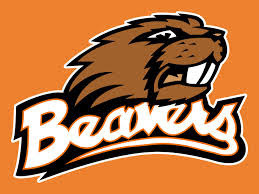 We live in Beaver country (OSU) and whenever my kids see a picture of the mascot, Bookworm3 yells out, "BENNY BEAVER!!!" After our time in Narnia she started yelling out, "MR. 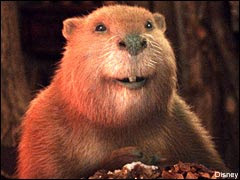 BEAVER!!!!" And since I am no great fan of football, this pleases me greatly. Mr. Beaver rules! Despite the fact that we didn't cover much ground in Narnia (or, as much as I would have liked), I had great fun with my kids and that's the most important thing. I had also committed to reading Planet Narnia and that book is well underway. I just haven't completed it yet so I'll be back with a review on it in a week or so. I'll link that one into the comment section when I've finished reading it. Lastly, we held a couple of Narnia-themed contests around here and it is indeed time to announce the winners, both chosen with Random.org. THE WINNER OF THE GIFT EDITION OF THE MAGICIAN'S NEPHEW IS #7 - Traveler. The winner of the paperback edition of the same title is #10 - Annette! And now we come to the part where you share of your adventures in Narnia. Did you participate this month and did you write up a blog post documenting your reading experiences? Please link up in the comment section below! If you do not have a blog but read along, please feel free to share your thoughs as well, also in the comment section. See ya back here next July for more Narnia (if I can wait that long)! We went the audio book route this year due to a road trip at the beginning of the month and managed to get through The LWW, Prince Caspian, Dawn Treader AND Horse and His Boy. I had hoped to read Horse and His Boy outloud this summer but had to settle for the Focus on the Family version. One thing I learned this year was about the picture that CSL was trying to paint with this story. As in the Horse and His Boy, where Shasta is trying to make his way to Narnia, never feeling that he truly belonged where he had been his whole life - CSL was trying to give the imagery of us heading towards and looking for our heavenly home because we never really belong here. I loved looking for that through the story as I read it this time! I read The Magician's Nephew (my thoughts here: http://barbarah.wordpress.com/2013/07/10/book-review-the-magicians-nephew/)and The Last Battle (http://barbarah.wordpress.com/2013/07/30/book-review-the-last-battle/), thus completing another trek through the series begun because of your challenge two years ago. I have so enjoyed visiting Narnia again! I read a book that explains itself in the title, Finding God in the Land of Narnia. It was a quick read and VERY enjoyable. Thanks for reminding me to go back to Narnia each summer!